The carnival started by electing a king of the carnival, who would rule the town or village through the festivities. It was often the village idiot or someone with low status in the town, usually with a grotesque or diabolic appearance. His task as king was to lead the disorder, mock the authority, order the games and playing and make sure everyone had food and drink after what they have deserved. Often the carnival started by the king – after a day of processions – parading through the streets with his entourage, legislate burlesque rules, changing public servants and office holders to his own followers and generally feasting and riots were called for. 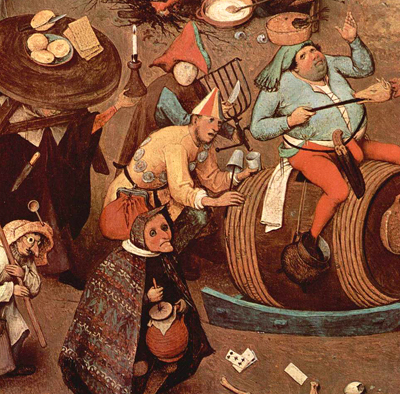 Of all the activities that belonged to the carnival, the begging and stealing of food may have been what is mostly have followed it in to Commedia dell’Arte and other forms of Vulgar Comedy. The entourage of the carnival king went around town begging and stealing food and drinks, followed by ritual fights between thieves and their victims. The turmoil that followed increased the wild energy that was part of the carnival. 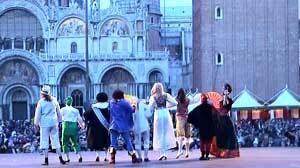 In Lombardy for instance the King of Carnival came riding in to town, right after being elected, to drive out the local potentates and gave orders about feast, dance, food and drinks. Other names for the King of Carnival was for example “Re dei Matti” in Lombardy, “Nunnu” in Sicily, “Charnage” or Pére Chalende” in France and “Lord of Misrule” or “Jack o’ Lent” in England. In some places there was also a queen or a female antagonist, which usually were just called “Lent”. Except from that the King of Carnival himself usually was a monstrous or diabolic figure, his suite was, especially in early times, devils, ghosts or other creatures from the underworld. (See the DIAVOLAS) Their function was, since they did not usually take part in more dramatized ceremonies, to create chaos and turmoil by mixing up thins, making noises and rumble around. The suite were never part of the main action. They prepared and assisted it. They also always appeared in groups. Among the characters in the entourage of the Carnival king we find masks, or the “prototype” to them, like: Arlecchino, Brighella or Pulcinella, il Magnifico and so on. Paolo Toschi have traced all the masks of Commedia dell’Arte from the masks of the carnival. Many of the carnival masks can also be traced to the ancient world. They always wore masks, and by the oldest masks that have been found we can definitely find demonic traits. Already here we find how the characters are being called “masks” (Italian: maschere) a word that comes from the Medieval Latin word masca, meaning evil spirit. Dante also used the word larvae, meaning the dead. The mask also had another more metaphysical function. (See MASK) It made the person who wore it into another role, and therefore he could not be held responsible for his actions. For instance in Venice there was a law that forbid persons to carry weapons when wearing a mask, except for the bauta mask that was only worn in order to hide the bearer’s identity. By the time the carnival started to reach its end, and lent was coming closer, the carnival ended with a symbolic trial against the King of Carnival. He was accused his sinful living, excesses and to have weakened and distorted society. Alternatively it ended with a fray between the King of Carnival and Lent. In Italy these frays were called “contrasti” and in France “débats”. In some places they had a strong literary emphasis and by time they become recognized literary genres. I both these cases the Carnival King lost and were sentenced to death. But before he was killed he read out his will. It was first of all a list of accuses and lists of sinners and sins committed within the local community, described in a humorous and satirical way and explaining what is weak and sick in society. The last part – the death of Carnival – was divided into two parts: the execution of the King of Carnival and his funeral. In Valfurva in Lombardy for example, the citizens hung up a doll representing the Carnival King, to later burn it while shouting “Out with the madman! Death to the Carnival!” Other societies slaughtered an animal instead as scapegoat. In Italy it was mostly a goat, in France a bear, in Asti a turkey and so on. Also the ways to kill Carnival was plenty. He could be burnt, shot, stoned. Sometimes a doll full of candy were made, much like the Mexican piñata. Finally the carnival was buried after a long procession. When “Lent” was part of the celebration, as antagonist to the King of Carnival, the carnival had even one more event, it was her preparation before the fasting. This entry was posted in 2 Vulgar Comedy, The Roots and tagged blog, blogg, buffoon, buffoons, carnival, carnival king, carnival mask, carnival masks, clown, clowns, comedy, commedia, Commedia dell arte, diavolos, fixed masks, fools, Italy, jack o lent, jesters, Klingvall, Kompani Komedi, lent, mask, masks, Micke Klingvall, Pantalone, physical theatre, renaissance, rite, rites, rituals, theatre teacher, vulgar, vulgar comedy, Zanni. Bookmark the permalink.